There are no indications that electronic systems on the USS John McCain were hacked in a cyberattack, but “all possibilities” will be considered in a review of the Aug. 20 incident, the U.S. chief of naval operations said. It was the second deadly collision at sea of its kind for the Navy in two months, and the fourth Navy ship incident in the Pacific region this year. On June 21, the destroyer USS Fitzgerald collided with the merchant ship MV ACX Crystal about 90 miles southwest of Tokyo. The incident killed seven sailors in their sleeping quarters below deck and severely damaged the warship’s hull. The Crystal was likely operating on autopilot at the time of the collision, raising the possibility that hackers may have broken into the ship’s control network and directed the ship to hit the Fitzgerald, Bill Gertz reported for the Washington Free Beacon. “The two destroyer collisions are unusual because warships are equipped with multiple radars capable of detecting ships as far as 20 miles out,” Gertz’s report said. “But we’re looking at every possibility, so we’re not leaving anything to chance,” Richardson told reporters on the Pentagon on Aug. 21. 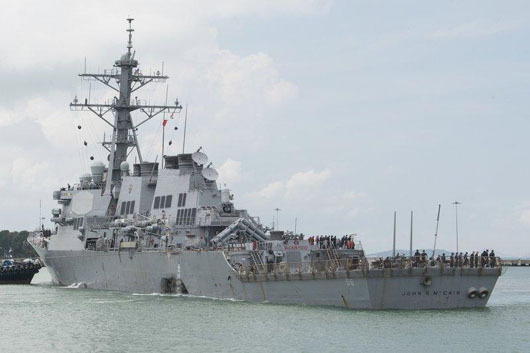 The USS John McCain collided with the Liberian-flagged oil tanker Alnic MC in the Straits of Malacca and Singapore, injuring five sailors and leaving 10 sailors missing. “Some remains” of the sailors who were declared missing after the collision were found in a sealed compartment aboard the destroyer on Aug. 22. Meanwhile, Malaysian officials said they found one body, but were still in the process of identifying it. “When you are going through the Strait of Malacca, you can’t tell me that a Navy destroyer doesn’t have a full navigation team going with full lookouts on every wing and extra people on radar,” he said. Itay Glick, the founder of a cyber security firm called Votiro, told News.com.au that his initial reaction to news of the USS McCain collision was that it may have been hacked. Glick worked in the cyber-warfare unit of the Israeli intelligence agency and pointed to the possibility of involvement from Russia and China. Richardson said he has ordered Navy ships to conduct an operational stand-down for one or two days so that procedures of all surface fleets can be reviewed. The operational pause means most Navy operational activities will halt during that period. “The emphasis of that is really to look at the fundamentals at the unit and team levels to make sure that we’re not overlooking anything in what I would call the blocking and tackling of the basic seamanship, airmanship, those sorts of things, team work, how we do business on the bridge,” Richardson said.